Dee Worley known in the world of sports as Dee Foster, USA and NCAA national and International Gymnastics champion. Today, Dee is a sought-after global branding, marketing, PR and business consulting expert at Worley Global Enterprises who talks about how a long lost love helped her to awaken to her purpose. 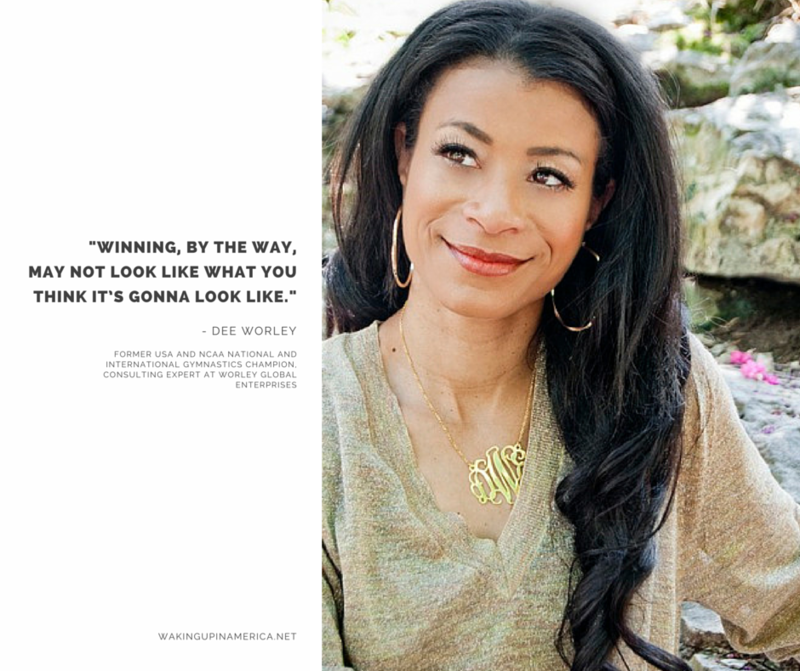 Today I’m chatting with Dee Worley known in the world of sports as Dee Foster, USA and NCAA national and International Gymnastics champion. Today, Dee is a sought-after global branding, marketing, PR and business consulting expert at Worley Global Enterprises who talks about how a long lost love helped her to awaken to her purpose. 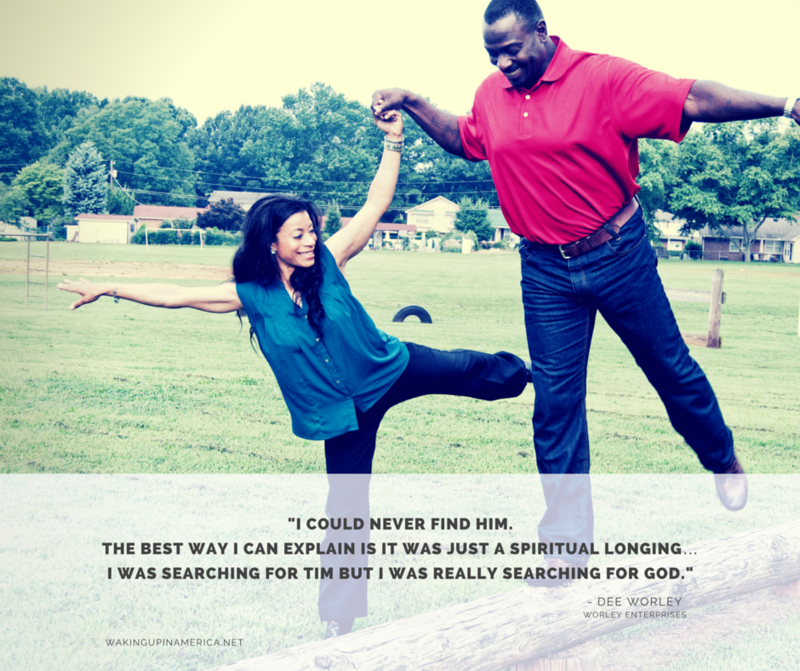 I reached out to Dee to ask if I could interview her husband Tim Worley (former NFL player and motivational coach) for my Waking Up in America show. As my husband and producer Matthew Cameron coordinated the shoot with Dee, he asked how the two met. What unfolded was an incredible love story I had to share. Dee always knew she was a gymnast. She followed her dream and became a national and international champion. She only recognized first place – everything that came below that wasn’t good enough. Her bitterness set in as she realized that winning wasn’t completely in her control, like when she couldn’t compete because her ligaments were severely torn. Or when her college boyfriend Tim, whom she planned to marry, cheated on her and left. Using her determination, discipline and talents, she moved on and became a successful PR and marketing consultant. But she was too detached, and she didn’t give herself enough time to process her grief and pain. She did a ‘Tim search’ every six months for 18 years. And she knows now that it wasn’t really Tim she was looking for. A beautiful cycle, and a process through which Dee healed and found her lost self. Reconnected to God, Dee healed from her pain and was also reconnected with the person she was always meant to be – the one who loves to help others, use her gifts to make this world a better place, and live as a true champion in life. Beautiful story, Dee! You found your way and when you did you were so much stronger and you learned so much along the way! Congratulations! Tajci, the music was also very, very good! Thanks so much! Listening is so uplifting!